The spectacular castle of Haut-Koenigsbourg occupies one of the top positions among the most visited historical sites across France. 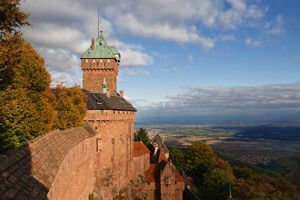 Around 60, 000 visitors each year proceed beyond the gates of the majestic palace, which stands majestically on a hill dominating the plain of Alsace. Haut-Koenigsbourg was built at 700 meters altitude in the French Vosges mountains. Built in the 12th century the castle was mainly restored to the last century but still retains it sbroadcast of impressive feudal. For the first time in historical texts the castle is mentioned in 1147 when the castle is given its name, in 1192 the same name is taken from the palace in Germany. The construction of the beautiful castle in the 12th century was mainly for the purpose of securing the key trade routes that pass there. To the north trading caravans passed with wine and wheat , and from west to east were carrying goods such as salt and silver. As a key trading post Haut-Koenigsbourg had much progress at the time of the Thirty Years War, yet after it was completely destroyed and abandoned in the hands of fortune for a long time. In 1899 Kaiser Wilhelm II decided to completely reconstruct the palace as a symbol of the return of Alsace into German hands. After this reconstruction the castle operated as a museum. Though actually built relatively recently, the architecture and interior of the castle look like they are intact since the Middle Ages. Inside, the palace halls are extremely impressed with the upgraded design. Everywhere you'll see the amazing frescoes, Renaissance furniture and cast iron stoves. In the cellar of Haut-Koenigsbourg today houses an interesting exhibition of military weapons and military gear which are retained from the Middle Ages. In the exhibition you can see unique examples of crossbows, swords and armor of any kind.